Redstone Federal Credit Union (RFCU) processed 2,230 skip payments and generated nearly $80,000 in fee income (62 percent of previous year’s income) after just two months of having the CUBUS Skip-A-Pay solution integrated into their core banking system. It’s very impressive that Redstone generated this kind of activity in just two months. The return on investment comes very quickly with Skip-A-Pay. CUBUS Solutions, a leader in online banking solutions for credit unions, announced that Redstone Federal Credit Union (RFCU) processed 2,230 skip payments and generated nearly $80,000 in fee income (62 percent of previous year’s income) after just two months of having the CUBUS Skip-A-Pay solution integrated into their core banking system. In time for the holiday skip season, RFCU integrated the Skip-A-Pay software which allows their members to request a skip online. The request is automatically processed based on the financial institution’s criteria, and tells the member which of their personal loans qualifies for a skip. This process, which eliminates the need for traditional paper processing, allowed RFCU to double the number of skips they had done in the past 12 months during the eight week period of November 19 through January 19, 2012. Typically RFCU was processing 3,500 skips per year. CUSkip-A-Pay provides automation for credit union members to request to skip a payment on certain types of loans. The software completely automates the process of qualification, advancing the due date, scheduling payments and charging fees – all functions that were necessary to complete manually in the past. Through case studies, CUBUS Solutions estimates that credit unions can save up to 37 minutes in staff time for each skip processed using CUSkip-A-Pay. RFCU is the largest credit union in the state of Alabama and is one of the top 25 largest federal credit unions in the United States. RFCU has over $3.4 billion in assets and nearly 350,000 members. The credit union has 21 branch locations in Huntsville and surrounding areas, along with 89 ATM stations. Skip-A-Pay offers many options which can be set as criteria for the skips. Once the criteria are set, the skips are conducted in real-time based on transactions and account status, essentially allowing the financial institution to set it and forget it. Beyond the customer experience, the backend of the process related to loan maintenance of the account has also been automated which saved RFCU thousands of dollars in paper costs and staff time with the elimination of approval and denial letters. CUBUS Solutions announced a partnership with Redstone Consultancy Group in November 2012. The two companies are collaborating to create purpose-driven online banking software solutions for credit unions. The first product in the development cycle was the Skip-A-Pay program. 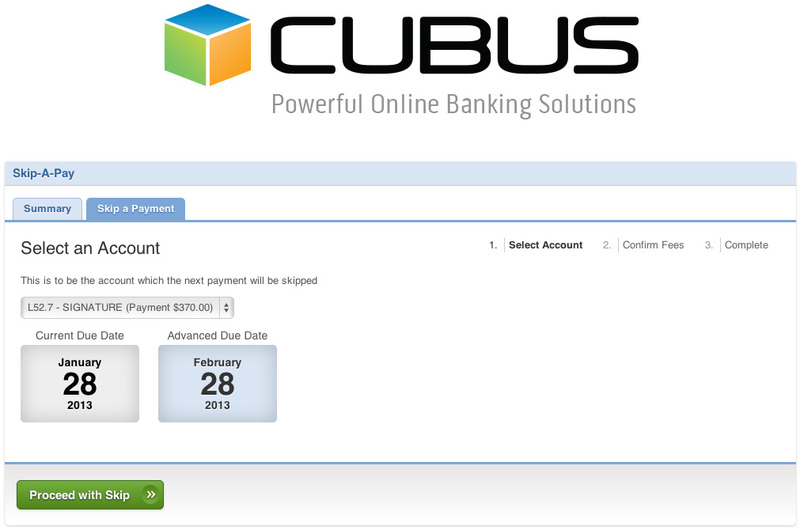 For more information on the CUBUS Skip-A-Pay, visit http://www.cubussolutions.com/skip. CUBUS Solutions is headquartered in Livermore, CA, and provides a powerful online banking platform for credit unions that integrates online banking, payments and finance management in one single interface. CUBUS and its online banking platform were built by executives and engineers with decades of combined experience with core data systems and the banking industry. CUBUS is a trusted solution provider with more than 10 years of proven success with its clients. For more information visit http://www.cubussolutions.com.